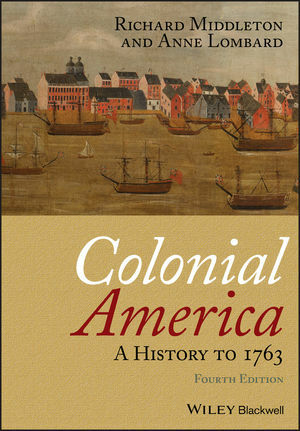 Colonial America: A History to 1763, 4th Edition provides updated and revised coverage of the background, founding, and development of the thirteen English North American colonies. Richard Middleton was for many years head of the American Studies department at Queen’s University, Belfast. He is the author of several books, including The Bells of Victory: The Pitt Newcastle Ministry and the Conduct of the Seven Years War (1985), and Pontiac’s War: Its Causes, Course and Consequences, 1763-1765 (2007). Now retired, Middleton is currently working on a book about the American War of Independence. Anne Lombard is Associate Professor, California State University, San Marcos. She is the author of Making Manhood: Growing Up Male in Colonial New England (2003). Her current research examines riots and other forms of collective violence by white men in British America during the eighteenth century. Part I: Old and New Worlds Meet:. 1. The Peoples of Eastern North America: Societies in Transition. 1 America Before Columbus and the Problem of History. 2 The Americas in Ancient Times. 3 The Eastern Woodlands, 1000–1300. 4 Eastern Woodlands Societies in Transition, 1300–1500. 5 Earliest Contacts with Europeans. 2. The Age of European Exploration. 2 The Portuguese in Africa. 3 Spain Encounters the New World. 5 England: The Elizabethan Prelude. Part II: The Seventeenth-Century Settlements:. 3. The English Conquer Virginia, 1607–1660. 1 Virginia Before the English. 2 The Virginia Company: Early Settlement. 3 The Charter of Liberties. 4 The Massacre of 1622 and Fall of the Company. 5 Growth and Consolidation, 1625–1660. 4. The Conquest Continues: New England, 1620–1660. 1 New England Before the English. 3 Massachusetts: A City on the Hill. 4 Establishing and Defending Order. 5. Diverse Colonies: New France, New Netherland, Maryland, and the West Indies. 2 New Netherland and Delaware: The Dutch and Swedish Beginnings. 3 Maryland: A Catholic Proprietary. 4 English Colonies in the West Indies. 1 The Return of Charles II. 2 Mercantilism: The Navigation Laws. 3 New York Becomes an English Colony. 4 The Carolinas: Early Settlement. 7. The Later Years of Charles II. 1 Virginia: Bacon’s Rebellion and Its Aftermath. 2 Massachusetts: The Struggle to Remain Self-Governing. 3 New Jersey and Pennsylvania: The Beginnings. 8. James II and the Glorious Revolution. 1 The Dominion of New England. 3 New York: Leisler’s Rebellion. 9. The Eras of William and Mary, and Queen Anne. 1 William and Mary’s Colonial Policy. 2 The Salem Witchcraft Trials. 3 War on the Northern Frontier, 1689–1713. 4 War and Political Change in the Carolinas. 5 Proprietary Problems in Pennsylvania and New Jersey. Part III: The Eighteenth-Century Provinces in a Changing Continent:. 10. The Economy and Labor System in British North America. 1 The British Atlantic Economy. 2 The Southern Plantation System. 3 Northern Farming and Commerce. 6 The Standard of Living: Poverty and Prosperity. 11. Settler Families and Society. 4 Social Structure: Rank and Class. 12. White Women and Gender. 1 Gender and the Settler Experience in the Seventeenth Century. 3 Gender in a Commercializing Culture: The Eighteenth-Century Refined Lady. 4 Gender in a Commercializing Culture: Middling and Working White Women. 13. British North American Religion, Education, and Culture, 1689–1760. 3 The Anglicization of Taste. 4 Libraries, Literature, and the Press. 5 Science and the Arts. 14. Slavery and the African American Experience, 1689–1760. 1 Slavery: An Evolving Institution. 3 The African American Family. 15. Expanding Spanish and French Empires in North America. 3 The Growth of New France. 4 The French Upper Country, or Pays d’en Haut. 7 Significance for the British Colonies. 16. Native American Societies and Cultures, 1689–1760. 1 Native American Societies in the Eighteenth Century. 2 The Nations of the Northern Frontier. 3 The Nations of the Southern Frontier. 17. Immigration and Expansion in British North America, 1714–1750. 1 The Germans and Scots-Irish. 2 The Founding of Georgia. 18. British North American Institutions of Government. 2 Local Government: Town Meeting and County Court. 3 The Provincial Assembly: Crown versus People. 4 Parties and Factions in the Age of Walpole. 5 Toward a Republican Ideology. 19. Britain, France, and Spain: The Imperial Contest, 1739–1763. 1 The War of Jenkins’ Ear. 2 The Struggle for the Ohio. 3 The Conquest of Canada.